Apologies for the lack of blogging lately. As I've said before, I'm super busy right now getting things sorted to move away. Who knew sorting out SAAS, my bank and phone details could be so stressful?! On top of sorting all this stuff out, I've been working almost every day for the last 2 weeks. I'm pooped. I decided one evening, to cheer myself up, I'd have a wee browse online and see if there was anything that caught my eye. I've always been a fan of the Charlotte Olympia cat shoes, made popular by the likes of Alexa Chung and Katy Perry, but at £465, the beautiful shoes have always been out (a long way out) of my student budget. 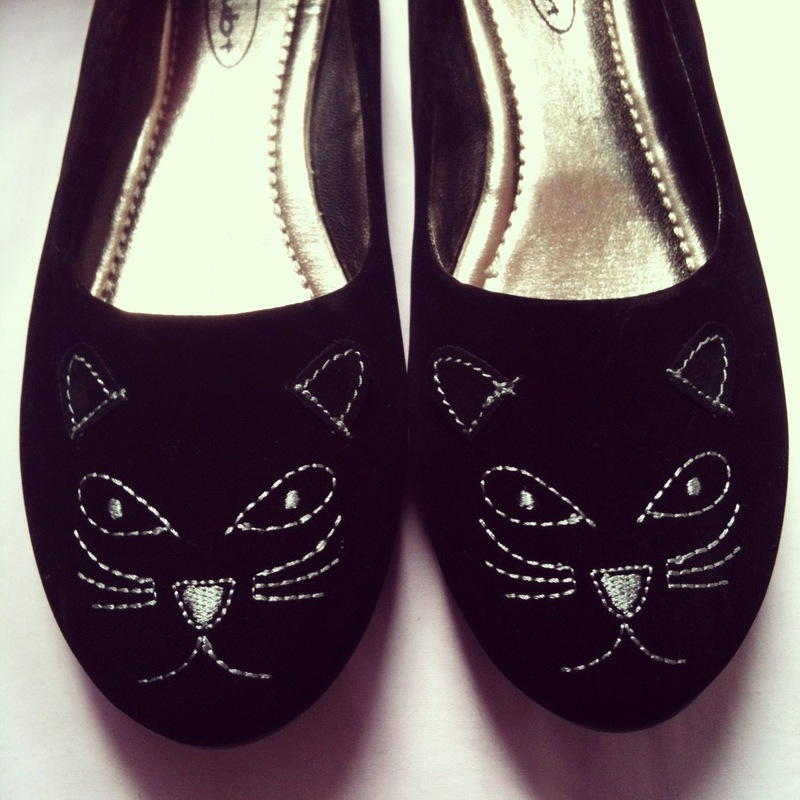 Fortunately, during my night of internet searching, I came across these similar and much cheaper cat face shoes. They arrived today and are absolutely adorable! They have easily become my new favourite shoes. Who wouldn't love these cute kittens?! Hope you are all doing well and again, apologies for being non-existent lately. I have lots of new outfits lined up to show you guys AND I've decided to dye my hair again, ombre style, and will hopefully, (if technology is kind to me) be creating an ombre hair tutorial video to show how you can create the look for yourself! ah love them!! so cute! kisses! These are so cute I need them!! Hi dear, welcome back. I loved these shoes when i saw them on Alexa, these are so adorable! oh my these shoes are way cute! I love the little cat face. Cute and quirky, I'm in love. The cutest shoes ever! Great post on finding a cheaper pair too, might have to get them come payday! Hi! I really like your blog, your photo's and content you post are just so great! I really hope we get to know each other as I will be visiting your blog often! Feel free to stop by my blog! I just started it a few days ago :). Follow?